Yesterday I was interviewed by the awesome Thomas Frank, founder of CollegeInfoGeek.com (check it out!) for his podcast for college students. Thomas started his blog while in college, and helps students regarding topics like study tactics, personal branding, and paying off college debt. So you can imagine, we had a pretty awesome time talking. (See, I told you he was awesome). My book focuses on the "Relationship Building" part of the triangle, but today I wanted to elaborate on how "Value Creation" can help you be successful in college and beyond. There are many ways you can create value on campus, and it's essential to both winning scholarships and generating career success after college. When International Dot Day was trending on Twitter I had to find out what was going on. Turns out it was inspired by this incredible children's book written in 2003. I bought it immediately and it made me cry. You'll have to read it to find out why, but essentially it shows how a teacher inspires a girl who thinks she can't draw. The teacher has the young girl just make a dot, and then tells her to sign it. The teacher then frames the picture/dot on her wall. The girl is inspired, empowered. And she starts creating more dots, more art. To me this story perfectly elucidates the importance of creating something now - with whatever you've got, whatever you're interested in. This incredible non-profit encourages high school students to create projects, "dreams with a deadline," and it's amazing. I was watching a bunch of their videos the other day and was in awe of some of the projects the students were creating, like a student who created a website and event to help students coping with loss. My good friend Erin writes the blog HappyProfessor.com, and wrote a book of the same title. Earlier this week we were both talking about the incredible feeling we got from creating a website and writing a book - how it's scary at first but that once you do it it makes you feel like you could do anything. Suddenly writing your next book or starting your next website doesn't seem so scary. In short, you feel empowered. You feel like maybe you really have something to offer the world. That maybe, just maybe, your actions actually matter. P.S. Doing a project you care about makes you INTERESTING. This in turn makes it much easier for you to make real connections in your community and online via social media (i.e. Building Relationships). People love hearing about new projects, and it shows that you are a person of action. And as you engage in projects and create value you'll start to get closer to what you really like to learn about and what skills you really want to develop, thus making you much more excited about learning. 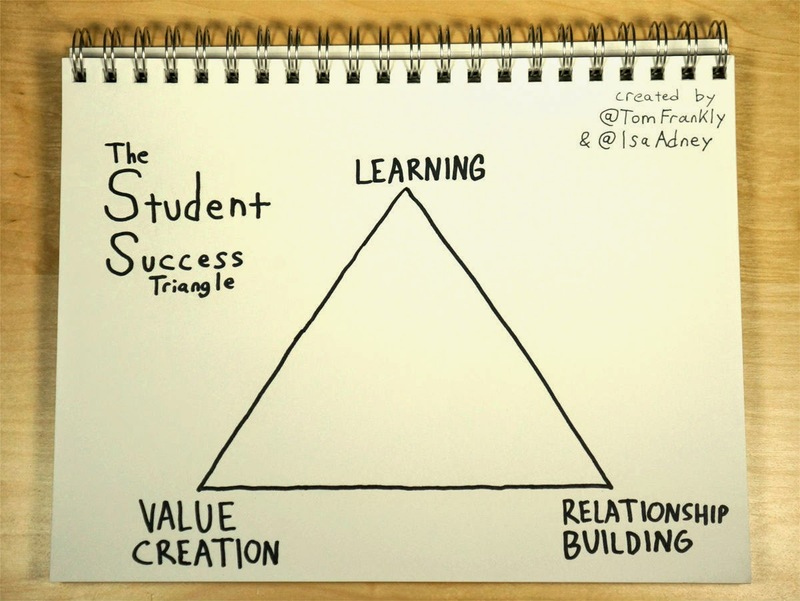 So are you ready to start to add value creation to your college success triangle? The key is to think about what you're most interested in and then just contribute to that area. DO something. MAKE something. Create something. Seek out help and don't do it on your own. And don't worry if it doesn't work the way you wanted it to. It doesn't have to be perfect. It just has to get done. Make your mark. You'll be amazed at what a little dot on a piece of paper can turn into. *At Stetson University I was required to embark on a year-long research project in order to complete my bachelor's degree. It was daunting, but accomplishing that 75-page research paper and presenting it out-of-state at a conference gave me the confidence and skills to write my book. It taught me how to break a giant writing project into smaller parts, and made me feel just so dang good that I actually COULD do something I previously thought terrifying. If starting a blog, a YouTube channel, a website, writing a book, or giving speeches appeals to you, you'll like the free ebook I wrote here about creating a personal brand through value creation.